Now this is a show I've never watched, but since 2 people I went to school with are going to be part of this Tuesdays show I've decided to watch it for once. Back home the news of this has been in various local papers and local radio stations to drum up further interest. Continuing with my love of the FA cup 3rd round, tomorrow night see's the replay of my home town, Burton, against Manchester United. Now I can't stand Man Utd at all, I know a lot of football fans can't, so why not become a Burton fan for the night!! Fantastic draw, exactly the kind of draw non-league teams dream of, after last nights 4–1 beating of Burscough, Cloughie's (Nigel that is) boys will go on to face Man Utd in the 3rd round in January, hopefully at the Pirelli. Well I get a phone call Friday afternoon, just before setting off for home, from my younger brother telling me about a fire at the 6th form. He's pretty pissed off as he has most likely lost all his work and notes as his bag was in the common room at the time. Local news has suggested that the police are treating it as arson – 3 people have been arrested in connection with Friday's events, with eyewitnesses commenting on yr9/10s spraying an aerosol into an air vent outside the 6th form study area and then lighting it, the fire then spreading throughout the 6th form block – blowing the windows clean out of the common room, leaving a good proportion of the 6th block ruined, including 8/9 classrooms, with suspected damage totalling millions (according to the Burton Mail). Staff attempted to extinguish the fire themselves initially but, eventually it took around 7 fire crews and many hours for the fire to be put out completely. Thankfully no-one was hurt, though one person did suffer an epiletic fit. 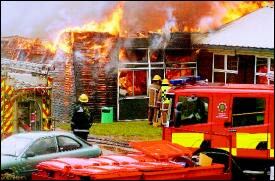 In a strange way, myself and many of my friends back home, when we were talking about it found it rather sad, as the 6th form was the best part of our 7 years there and the parts that burnt down are the location of so many amusing memories. With the news that tyre changing is to be reintroduced into Formula 1 for the 2006 season, I believe Michelin have a point a being somewhat pissed off about it. The point of the one tyre rule was cutting costs and better racing as tyres had to be managed – Kimi at the Nurimburgring wouldn't have happened without that flat-spotted tyre, and Michelin excelled at producing an excellent one tyre race compound and deservedly won all the races bar the Indy fiasco. I can't help but be skeptical and wonder if there wasn't some pressure from Ferrari to get tyre stops back for next season. The Ferrari / Bridgestone combo had won all titles since Michelin returned to the sport several years, and of course Ferrari, practically sitting in the FIA/Bernies pocket on most issues will have pushed for situations to help get back that dominance. I just seriously hope next year its not a case of a Ferrari pulling away and the rest battling on behind, granted I am not a Ferrari or a Schumacher fan, but surely true F1 fans want great racing, and all these rule reg changes season after season can not always be helping the cause. I'd love to be able to listen to song and just play it, but then having to work so hard makes it rewarding on the rare ocassions I get it spot on, I miss playing guitar during term time as it's back at home – it can be so relaxing when stressed.